Colby Welding & Radiator, Inc. has been providing high quality welding and radiator repair services for a variety of automotive, truck, industrial, and construction needs for over 15 years. Collectively, our skilled Phoenix technicians have over 150 years of experience and can handle radiator, welding, oil cooler, charge air cooler, and air conditioning condenser and evaporator repairs with ease. When you want a fast turnaround, cost effective rates, and personal customer service, choose Colby Welding & Radiator, Inc. every time. 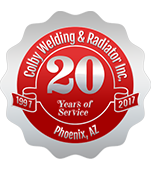 At Colby Welding & Radiator, Inc. we specialize in welding and radiator repairs for the automotive, truck, industrial, and construction industries in Phoenix. From trailer welding and heavy equipment welding to radiator repairs on your semi truck or personal vehicle, our technicians can handle all of your needs, both large and small-scale. Our welding and radiator technicians have extensive training and experience to effectively diagnose any issues you’re currently having with your radiator and make the repairs immediately. Colby Welding & Radiator, Inc.